Home » artikel » Does An Elephant Bite? Elephant, perhaps it is the biggest animal in the world todays. It can be more than 2 tons in weigh. The animal, sometimes, will frighten people, escpecially children. Yes, it is because of the size. This kind of animals can be wild. Besides, it can also be tamed, based on the situation the animal faces. But, does it bite? Have you ever heard that an elephant bite? Of course not. 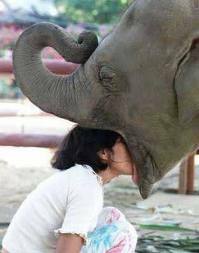 Elephant does not bite, even though it is big. This is an analogy for problems. Sometimes we are afraid of facing big problem. We only focus on them as we think that the probems will "bite" us. Big problem does not always mean complicated. The size or coverage of the problem can be big and wide, still when you find it a big problem of course you will be aware of soon. You will be more ready for that. There is no house without doors. There will be always a solution for any problem we posses. But sometimes because of the size we overact in preparing that will result in something messy. On the other side, sometimes we do not care enough with the small problems. Be careful! Ignoring the small ones usually result in big problems. Virus is far smaller than an elephant, isn't it? But a virus can be more dangerous. It is becuase we can not observe it. We are not aware of the existance. How many people dying because of virus? Dangue fever, cholera, HIV, and some other virus caused deseases result in dying? There are more people died because of virus than elephant. So, both big and small problems must be recognized and solved soon. Put our focus and treatment on each problem with the suitable solution. The proportion of each handling of the problems must be taken. Be careful of the big problems, but never ignore the small one. An elephant will not bite, but a virus can kill you. 0 Response to "Does An Elephant Bite?"